Purpose: To compare the results of manual phacofracture trabeculectomy (manual small incision cataract surgery trabeculectomy) versus phacotrabeculectomy with respect to visual gain and intraocular pressure (IOP) control. Materials and Methods: Thirty consecutive patients who underwent combined surgery performed by the same surgeon were prospectively evaluated for a minimum period of 12 months. Fifteen patients underwent single site phacotrabeculectomy, and the remaining 15 patients underwent single site phacofracture trabeculectomy at Guru Nanak Eye Hospital, New Delhi. Results: Both surgeries resulted in a highly significant decrease in IOP, the final percentage reduction being 46% in phacotrabeculectomy group and 44% in phacofracture trabeculectomy group. The complete success rate (IOP < 21 mmHg) without additional antiglaucoma medications was 100% for both the groups till l2 months of follow-up. Improvement in visual acuity was similar in both the groups with 53% patients in phacotrabeculectomy and 60% in phacofracture trabeculectomy group attaining a final visual acuity of 20/40 or better. The mean surgically induced astigmatism was 1.33 D and 1.3 D in phacotrabeculectomy and phacofracture trabeculectomy group respectively, at the end of 12 months follow-up. 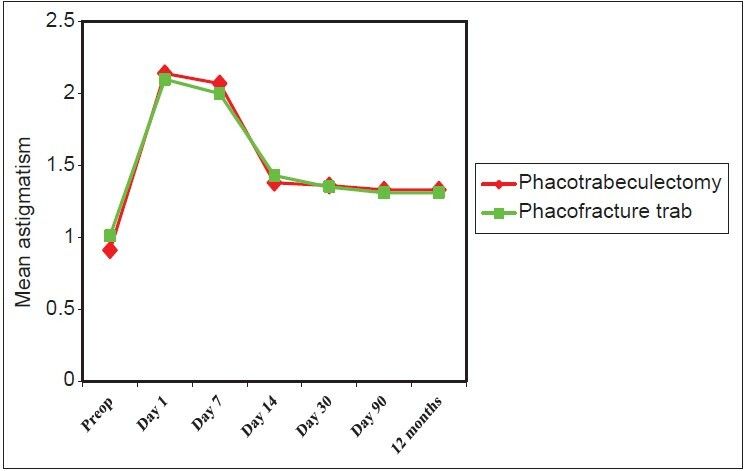 Manual phacofracture trabeculectomy resulted in more early postoperative inflammation within the first 7 days. Conclusions: There was no statistically significant difference in the final visual acuity, IOP control and surgically induced astigmatism between phacofracture trabeculectomy and phacotrabeculectomy groups. The simultaneous presence of two ocular pathologies such as glaucoma and cataract often influences the ophthalmologist to use a combined surgical procedure, which simultaneously deals with both the diseases. ,,,, In glaucoma patients undergoing cataract extraction, concomitant trabeculectomy not only reduces the damaging effects of early postoperative spikes of intraocular pressure (IOP), but also provides a long term control of IOP. ,,,,,,,,,,,,,,,,,, It thus grants the patient independence from multiple glaucoma drugs and improves patient quality of life. The refinement in manual small incision cataract surgery (MSICS) and phacoemulsification has brought new options for combined procedures. Smaller scleral and conjunctival incisions come with the advantage of lesser surgical insult, thereby less subsequent inflammation and wound healing stimuli. Conjunctival fibrosis is consequently reduced, and longevity of the bleb filtration is enhanced. ,,,,,,,, Smaller scleral incisions also reduce postoperative astigmatism thereby enabling early visual rehabilitation. ,,,,,,,, In the present study, we compared the advantages offered by phacoemulsification over manual phacofracture in the combined operation for cataract and glaucoma. A prospective study involving 30 eyes of 30 patients comprising of a cohort of 19 women and 11 men aged 40-85 years, undergoing combined surgery was conducted with a minimum follow-up of 1 year. Selection criteria included a visually disabling cataract along with poorly controlled glaucoma on more than two antiglaucoma drugs or very high IOP (>35 mm Hg) at presentation. Patients who had central corneal opacities, congenital/developmental glaucoma, and acute or chronic inflammatory eye disease were excluded from the study. The patients were divided into two groups. The study group underwent phacofracture with trabeculectomy and the control group underwent scleral tunnel phacoemulsification with trabeculectomy. The preoperative best corrected visual acuity, IOP, corneal thickness, keratometry, refraction, anterior chamber depth, axial length, gonioscopy, non-contact corneal endothelial cell counts and visual fields (24-2 humphrey fields) were recorded in both the groups. The mean values were compared with the postsurgical values in both the groups over a 1 year follow-up period. The complete success rate of surgery was defined as IOP < 21 mmHg without additional antiglaucoma medications. For statistical analysis, Student's t-test and paired t-test were performed using SPSS software version 17 ((SPSS ® , Inc., Chicago, IL, USA), for Windows ® ). The mean age in phacotrabeculectomy group was 61 ± 9 (range-40-85) years and 56 ± 8 (range-40-85) years in phacofracture trabeculectomy group with no intergroup statistically significant difference. In the phacotrabeculectomy group, 11 (73%) patients were suffering from chronic angle closure glaucoma (CACG), rest 4 (27%) had open angle glaucoma (OAG) whereas in phacofracture group 10 (67%) patients had CACG and 5 (33%) had OAG. The preoperative mean IOP in both phacotrabeculectomy and phacofracture trabeculectomy groups was 29 ± 3 mm Hg. The reduction in mean IOP at the end of 3 months was 46% in the phacotrab-eculectomy group and 44% in phacofracture trabeculectomy group. At the 12 months follow-up the percentage reduction was similar to that seen at 3 months. The intergroup difference was not statistically significant at any time. No case developed ocular hypotony (<4 mm Hg) at any time during the follow-up period. The complete success rate (IOP < 21 mm Hg) without additional antiglaucoma medications was 100% in both the groups at the interim follow-up of 3 months and at the last follow-up of 12 months. [Table 1] shows IOP levels at the specifi ed follow-up periods. The percentage reduction in mean postoperative IOP from the preoperative values with time is detailed in the [Table 2] and [Figure 1]. The range of preoperative visual acuity in log minimum angle of resolution equivalent varied from 0.5 to 3 in both the groups and the mean visual acuity was 2.14 in phacotrabeculectomy group and 2.21 in phacofracture group. Postoperatively 53% patients in phacotrabeculectomy group and 60% patients in phacofracture group had final corrected visual acuity of 0.3 or better. [Table 3] depicts the mean postoperative visual acuity in the two groups. At no time in the follow-up period could any significant difference be detected between the two groups. The mean increase of visual acuity in the two groups was comparable on all postoperative days. At the 12 months follow-up the visual acuity was maintained in all except one case who developed posterior capsule opacification necessitating Nd: YAG capsulotomy in the manual phacofracture trabeculectomy group [Figure 2]. In the phacotrabeculectomy group, the surgery induced an astigmatism of 2.14 D on day 1, which was a 179% increase from preoperative value; mean increase of 1.22 ± 0.51 D. The astigmatism declined to 1.38 D on day 14 (postsuture removal) and stabilised at 1.33 D by the end of 3 months, an ultimate change of 61.66% from preoperative value. In phacofracture trabeculectomy group, the mean astigmatism on day 1 was 2.10 D, which translates into a 167.5% change from the preoperative value. This declined to 1.43 D on day 14 (after bleb forming suture removal) and stabilised at 1.3 D at the end of 3 months an ultimate change by 55.8% from the preoperative level. After this period, there was no further decline in the induced astigmatism. There was no statistically significant difference between the two groups at any time interval in the astigmatism induced (P = 0.888, P = 0.842 and P = 0.944 on day 1, day 14 and day 90 respectively). [Figure 3] depicts the astigmatism decline over time. Preoperatively central corneal thickness as measured by ultrasonic pachymetry was 0.53 mm in both phacotrabeculectomy group and phacofracture trabeculectomy group. On first postoperative day it increased to 0.556 mm (5.3% increase) in phacotrabeculectomy group and 0.560 mm (6.29% increase) in phacofracture trabeculectomy group, which was a statistically significant increase. The corneal edema subsided by day 7 in all cases. The preoperatively mean corneal endothelial cell count was 2691 cells/mm 2 in phacotrabeculectomy group whereas in phacofracture trabeculectomy group it was 2733 cells/mm 2 , the difference being, not statistically significant. At the final follow-up of 12 months, specular microscopy revealed an endothelial cell loss of 11.7% in the phacotrabeculectomy group, which was statistically significant (P = 0.006) while in phacofracture trabeculectomy group the corresponding figure was 13% at 12 months, which was again statistically significant (P = 0.000). However, no statistically significant intergroup difference was noted [Table 4]. There was no anterior chamber inflammation in 67% patients of phacotrabeculectomy group, whereas in the phacofracture trabeculectomy group only 33% cases were free from the inflammatory reaction. The reaction resolved completely by day 14 in both the groups. The grade of anterior chamber inflammation is depicted in [Figure 4]. Anterior chamber deepened by 24% in phacotrabeculectomy group and 23% in phacofracture trabeculectomy group, with no statistically significant intergroup difference. At no time was any anterior chamber shallowing noted. 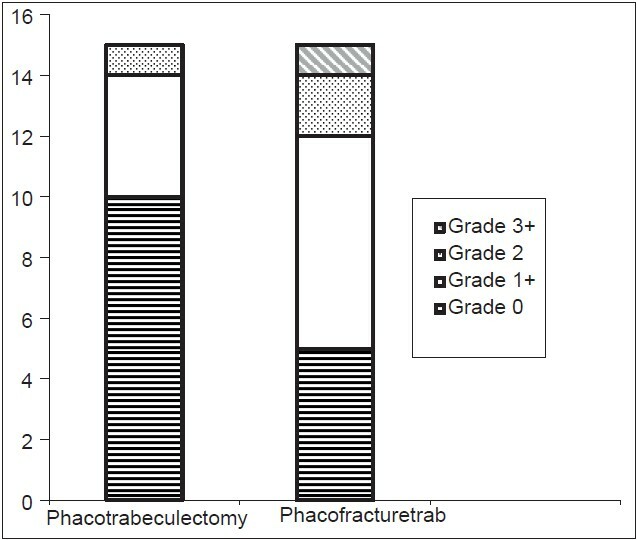 The axial length decreased by 0.8% in the phacotrabeculectomy group and 0.4% in phacofracture trabeculectomy group by the end of 12 months. Trabeculectomy combined with cataract surgery is considered a safe, effective and economical strategy in the management of cataract associated with glaucoma. ,,,,, It prevents early IOP spikes responsible for visual field wipeout in advanced glaucoma and provides visual rehabilitation with long-term IOP control. ,,,,,,,,,,,,, Also, both the diseases are controlled in a single sitting, thus it eliminates the need for glaucoma medications and frequent follow-ups. ,,,,,,, The advent of small incision cataract surgery both by phacoemulsification or manual small incision along with trabeculectomy has improved the IOP control outcome, ,,,,,,,,,,,,,,,, reduced complications and has made combined surgery technically faster and superior. Other advantages include less induced astigmatism, early visual rehabilitation, reduced stimuli to wound healing, inflammation and postoperative bleb scarring and thus improving long-term filtration. ,,,,,,,,,,,,,,,, Thus, the credo of today is small incision cataract surgery whether it be the sophisticated instrument dependent phacoemulsification or the phacofracture technique. Our results suggest that there is no significant difference in visual acuity and IOP control between phacotrabeculectomy and phacofracture trabeculectomy. The final percentage reduction in mean IOP was 46% in phacoemulsification with trabeculectomy group and 44% in the phacofracture trabeculectomy group. No postoperative hypotony (IOP < 6 mm Hg) or IOP spikes were noted. In our study, we could not document any statistically significant difference amongst the two groups in terms of mean astigmatism on keratometry preoperatively (P = 0.653). Postoperatively there was a mean astigmatism of 2 D on day 1 (mean change of 1.2 ± 0.5), which reduced to 1.4 D on day 14 (after suture removal) and was 1.3 D at end of 12 months. 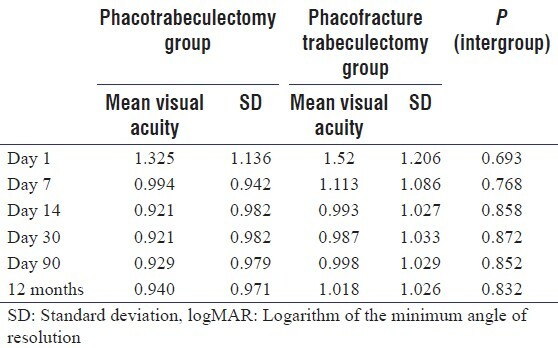 For phacofracture trabeculectomy group, the mean astigmatism on day 1 was 2 D (a mean change of 1 ± 0.4), which reduced to 1.4 D on day 14 (after suture removal) and at end of 12 months it was 1.3 D (thus contributing to a permanent change of 0.3 ± 0.2 D. There was no statistically significant difference between the two groups. 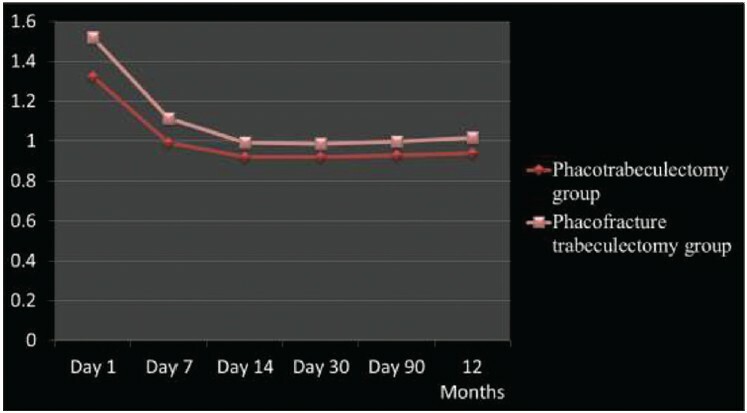 Suture removal contributed to a drastic decrease in astigmatism of 0.7 ± 0.3 D (34% change) in the phacotrabeculectomy group and 0.6 ± 0.3 D (31%) in the phacofracture trabeculectomy group, within 1 week, which was highly significant for both the groups (P = 0.000 in both). 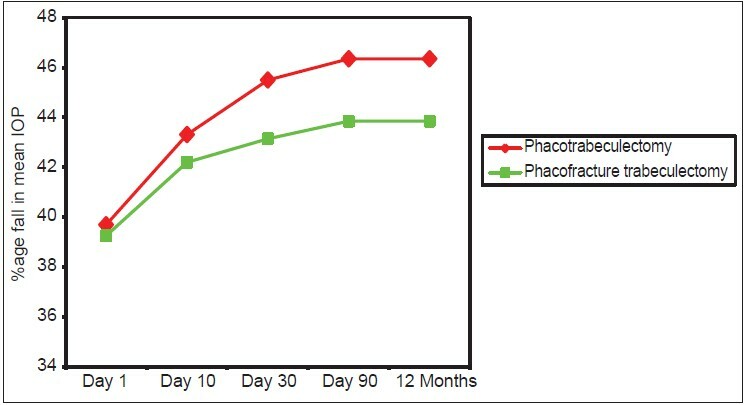 Anterior chamber inflammation was relatively more in the 1 st week in phacofracture group, but this did not extend beyond day 10. The explanation elucidated for this is that the maintenance of a relatively controlled IOP during phacoemulsification incites less chamber reaction. Prior studies by Tezel et al. and Wishart et al. that have compared ECCE trabeculectomy with phacotrabeculectomy also documented lesser anterior chamber inflammatory reaction in phacotrabeculectomy group. The similar and excellent results achieved in our two groups imply that either technique might be used to handle the problem of concurrent cataract and glaucoma and encourages us to consider adopting the less infrastructure dependent, technically easier, more economical, MSICS trabeculectomy for combined cataract and glaucoma surgery, in developing countries. Phacofracture trabeculectomy and phacotrabeculectomy are equally efficacious in terms of IOP control, visual acuity gain and surgically induced astigmatism. Thus, phacofracture trabeculectomy is a viable alternative to expensive and infrastructure dependent phacotrabeculectomy. Jerndal T, Lundström M. Trabeculectomy combined with cataract extraction. Am J Ophthalmol 1976;81:227-31. Johns GE, Layden WE. Combined trabeculectomy and cataract extraction. Am J Ophthalmol 1979;88:973-81. Shields MB. Combined cataract extraction and glaucoma surgery. Ophthalmology 1982;89:231-7. Savage JA, Thomas JV, Belcher CD 3 rd , Simmons RJ. Extracapsular cataract extraction and posterior chamber intraocular lens implantation in glaucomatous eyes. Ophthalmology 1985;92:1506-16. Naveh N, Kottass R, Glovinsky J, Blumenthal M, Bar-Sever D. The long-term effect on intraocular pressure of a procedure combining trabeculectomy and cataract surgery, as compared with trabeculectomy alone. Ophthalmic Surg 1990;21:339-45. Krupin T, Feitl ME, Bishop KI. Postoperative intraocular pressure rise in open-angle glaucoma patients after cataract or combined cataract-filtration surgery. Ophthalmology 1989;96:579-84. Shields MB. Another reevaluation of combined cataract and glaucoma surgery. Am J Ophthalmol 1993;115:806-11. McCartney DL, Memmen JE, Stark WJ, Quigley HA, Maumenee AE, Gottsch JD, et al. The efficacy and safety of combined trabeculectomy, cataract extraction, and intraocular lens implantation. Ophthalmology 1988;95:754-63. Katz LJ, Costa VP, Spaeth GL. In: Ritch R, Shields MB, Krupin T, editors. The Glaucomas. 3 rd ed. St. Louis: Mosby-Year book; 1996. p. 1661-702. Dittmer K, Quentin CD. Intraocular pressure regulation after combined glaucoma and cataract operation. Ophthalmology 1998;95:499-503. Hopkins JJ, Apel A, Trope GE, Rootman DS. Early intraocular pressure after phacoemulsification combined with trabeculectomy. Ophthalmic Surg Lasers 1998;29:273-9. Stewart WC, Crinkley CM, Carlson AN. Results of trabeculectomy combined with phacoemulsification versus trabeculectomy combined with extracapsular cataract extraction in patients with advanced glaucoma. Ophthalmic Surg 1994;25:621-7. Neumann R, Zalish M, Oliver M. Effect of intraocular lens implantation on combined extracapsular cataract extraction with trabeculectomy: A comparative study. Br J Ophthalmol 1988;72:741-5. Anders N, Pham T, Holschbach A, Wollensak J. Combined phacoemulsification and filtering surgery with the 'no-stitch' technique. Arch Ophthalmol 1997;115:1245-9. Friedman DS, Jampel HD, Lubomski LH, Kempen JH, Quigley H, Congdon N, et al. Surgical strategies for coexisting glaucoma and cataract: An evidence-based update. Ophthalmology 2002;109:1902-13. Murchison JF Jr, Shields MB. An evaluation of three surgical approaches for coexisting cataract and glaucoma. Ophthalmic Surg 1989;20:393-8. Nielsen PJ. Combined small-incision cataract surgery and trabeculectomy: A prospective study with 1 year of follow-up. Ophthalmic Surg Lasers 1997;28:21-9. Gregg FM. Phacoemulsification and modified trabeculectomy for managing combined cataracts and glaucoma. J Cataract Refract Surg 1992;18:362-5. Schuman JS. Surgical management of coexisting cataract and glaucoma. Ophthalmic Surg Lasers 1996;27:45-59. Hennis HL, Stewart WC. The use of 5-fluorouracil in patients following combined trabeculectomy and cataract extraction. Ophthalmic Surg 1991;22:451-4. Bobrow JC. Prospective intrapatient comparison of extracapsular cataract extraction and lens implantation with and without trabeculectomy. Ophthalmic Surg 1993;24:814-21. Stewart WC, Sine CS, Carlson AN. Three-millimeter versus 6-mm incisions in combined phacoemulsification and trabeculectomy. Ophthalmic Surg Lasers 1996;27:832-8. Lyle WA, Jin JC. Comparison of a 3- and 6-mm incision in combined phacoemulsification and trabeculectomy. Am J Ophthalmol 1991;111:189-96. Tezel G, Kolker AE, Kass MA, Wax MB. Comparative results of combined procedures for glaucoma and cataract: I. Extracapsular cataract extraction versus phacoemulsification and foldable versus rigid intraocular lenses. Ophthalmic Surg Lasers 1997;28:539-50. Shingleton BJ, Jacobson LM, Kuperwaser MC. Comparison of combined cataract and glaucoma surgery using planned extracapsular and phacoemulsification techniques. Ophthalmic Surg Lasers 1995;26:414-9. Seah SK, Jap A, Prata JA Jr, Baerveldt G, Lee PP, Heuer DK, et al. Cataract surgery after trabeculectomy. Ophthalmic Surg Lasers 1996;27:587-94. Wand M. Combined phacoemulsification, intraocular lens implant, and trabeculectomy with intraoperative mitomycin-C: Comparison between 3.2- and 6.0-mm incisions. J Glaucoma 1996;5:301-7. Munden PM, Alward WL. Combined phacoemulsification, posterior chamber intraocular lens implantation, and trabeculectomy with mitomycin C. Am J Ophthalmol 1995;119:20-9. Wishart PK, Austin MW. Combined cataract extraction and trabeculectomy: Phacoemulsification compared with extracapsular technique. Ophthalmic Surg 1993;24:814-21. Allan BD, Barrett GD. Combined small incision phacoemulsification and trabeculectomy. J Cataract Refract Surg 1993;19:97-102. Wedrich A, Menapace R, Radax U, Papapanos P. Long-term results of combined trabeculectomy and small incision cataract surgery. J Cataract Refract Surg 1995;21:49-54. Gous PN, Roux P. Preliminary report of sutureless phacotrabeculectomy through a modified self-sealing scleral tunnel incision. J Cataract Refract Surg 1995;21:160-9. Migdal C, Hitchings R. The developing bleb: Effect of topical antiprostaglandins on the outcome of glaucoma fistulising surgery. Br J Ophthalmol 1983;67:655-60. Liaska A, Papaconstantinou D, Georgalas I, Koutsandrea C, Theodosiadis P, Chatzistefanou K. Phaco-trabeculectomy in controlled, advanced, open-angle glaucoma and cataract: Parallel, randomized clinical study of efficacy and safety. Semin Ophthalmol 2014;29:226-35. Gosiengfiao DH, Latina MA. Avoiding complications in combined phacotrabeculectomy. Semin Ophthalmol 2002;17:138-43. Borggrefe J, Lieb W, Grehn F. A prospective randomized comparison of two techniques of combined cataract-glaucoma surgery. Graefes Arch Clin Exp Ophthalmol 1999;237:887-92. Hsu CH, Obstbaum SA. Technique and outcome of combined phacoemulsification and trabeculectomy. Curr Opin Ophthalmol 1998;9:9-14. Yu CB, Chong NH, Caesar RH, Boodhoo MG, Condon RW. Long-term results of combined cataract and glaucoma surgery versus trabeculectomy alone in low-risk patients. J Cataract Refract Surg 1996;22:352-7. Parker JS, Gollamudi S, John G, Stark WJ. Combined trabeculectomy, cataract extraction, and foldable lens implantation. J Cataract Refract Surg 1992;18:582-5. Murchison JF Jr, Shields MB. Limbal-based vs fornix-based conjunctival flaps in combined extracapsular cataract surgery and glaucoma filtering procedure. Am J Ophthalmol 1990;109:709-15. Tham CC, Leung DY, Kwong YY, Li FC, Lai JS, Lam DS. Effects of phacoemulsification versus combined phaco-trabeculectomy on drainage angle status in primary angle closure glaucoma (PACG). J Glaucoma 2010;19:119-23. Minassian DC, Rosen P, Dart JK, Reidy A, Desai P, Sidhu M, et al. Extracapsular cataract extraction compared with small incision surgery by phacoemulsification: A randomised trial. Br J Ophthalmol 2001;85:822-9. Gogate PM, Deshpande M, Wormald RP. Is manual small incision cataract surgery affordable in the developing countries? A cost comparison with extracapsular cataract extraction. Br J Ophthalmol 2003;87:843-6. Chia WL, Goldberg I. Comparison of extracapsular and phaco-emulsification cataract extraction techniques when combined with intra-ocular lens placement and trabeculectomy: Short-term results. Aust N Z J Ophthalmol 1998;26:19-27. Kosmin AS, Wishart PK, Ridges PJ. Long-term intraocular pressure control after cataract extraction with trabeculectomy: Phacoemulsification versus extracapsular technique. J Cataract Refract Surg 1998;24:249-55. Cagini C, Murdolo P, Gallai R. Longterm results of one-site phacotrabeculectomy. Acta Ophthalmol Scand 2003;81:233-6. Storr-Paulsen A, Bernth-Petersen P. Combined cataract and glaucoma surgery. Curr Opin Ophthalmol 2001;12:41-6. El Sayyad F, el-Maghraby A. The contribution of phacoemulsification to combined cataract and glaucoma surgery. Curr Opin Ophthalmol 1998;9:95-100. Tham CC, Kwong YY, Leung DY, Lam SW, Li FC, Chiu TY, et al. Phacoemulsification versus combined phacotrabeculectomy in medically uncontrolled chronic angle closure glaucoma with cataracts. Ophthalmology 2009;116:725-31.e1. Husain R. The management of patients with cataracts and medically uncontrolled glaucoma. Med Hypothesis Discov Innov Ophthalmol 2014;3:20-30. Wang M, Fang M, Bai YJ, Zhang WZ, Lin MK, Liu BQ, et al. Comparison of combined phacotrabeculectomy with trabeculectomy only in the treatment of primary angle-closure glaucoma. Chin Med J (Engl) 2012;125:1429-33. Tous HM, Nevárez J. Comparison of outcomes following combined ECCE-trabeculectomy versus phacoemulsification-trabeculectomy. P R Health Sci J 2006;25:319-23. Thomas R, Parikh R, Muliyil J. Comparison between phacoemulsification and the Blumenthal technique of manual small-incision cataract surgery combined with trabeculectomy. J Glaucoma 2003;12:333-9. Ventura AC, Wälti R, Böhnke M. Corneal thickness and endothelial density before and after cataract surgery. Br J Ophthalmol 2001;85:18-20. Amon M, Menapace R, Radax U, Papapanos P. Endothelial cell density and corneal pachometry after no-stitch, small-incision cataract surgery. Doc Ophthalmol 1992;81:301-7. Altan C, Bayraktar S, Altan T, Eren H, Yilmaz OF. Anterior chamber depth, iridocorneal angle width, and intraocular pressure changes after uneventful phacoemulsification in eyes without glaucoma and with open iridocorneal angles. J Cataract Refract Surg 2004;30:832-8. Francis BA, Wang M, Lei H, Du LT, Minckler DS, Green RL, et al. Changes in axial length following trabeculectomy and glaucoma drainage device surgery. Br J Ophthalmol 2005;89:17-20.